Around 3.30pm we head out to purchase our 3 days Angkor Temples pass that cost US$40 ($$ fly away). There’s also the choice of 1 day pass @ US$20 or 7 days pass @ US$60. When you purchase the pass, you need to inform which date you’re visiting the temples because the operator will print the visiting dates on the pass. Also they will take your photo with web cam. Your picture will be printed on the pass. All this is done in less than 2 minutes. Yup that fast. And because of this I forgot to take some photos at the counter. Aiyak. Btw the temple pass is made of paper. So be careful ya. Once the pass is torn you need to get another ticket. More $$ fly away. Anyway we came prepared. We bring plastic card case from home so that we can keep our pass in there. So every time when we were asked to show our admission ticket, we just flash our plastic. Haha Or you can get them laminated at the counter office (somewhere). Our first temple destination is Preah Khan. 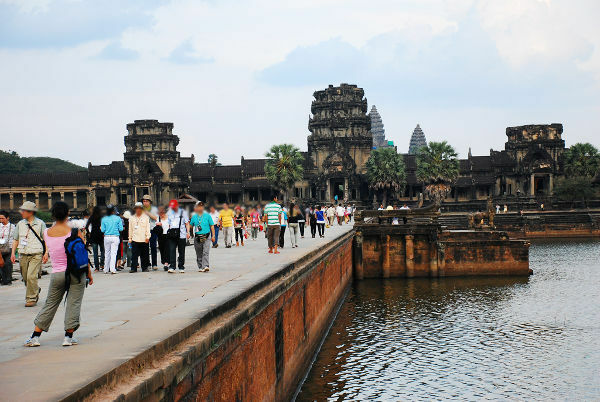 To go there we must first pass-by Angkor Wat… ahh what a sight! I had goose-bumps as we neared Angkor Wat. Then we entered Angkor Thom through South Gate, passed by Bayon… wohooo. We stopped for toilet because there’s no toilet near Preah Khan but I forgot where. It’s very dark in the toilet. FOC when you show them the temple pass. Then off we went through the North Gate. Then everything look so quite. It was 4pm. The road is deserted. Anyway once we reached Preah Khan my tuk-tuk driver asked me a very scary question. He must be thinking we’re crazy. Does anybody do that? Do you enter one gate and exit the other or you exit the same point you entered? Tell me. I’m really eager to know. 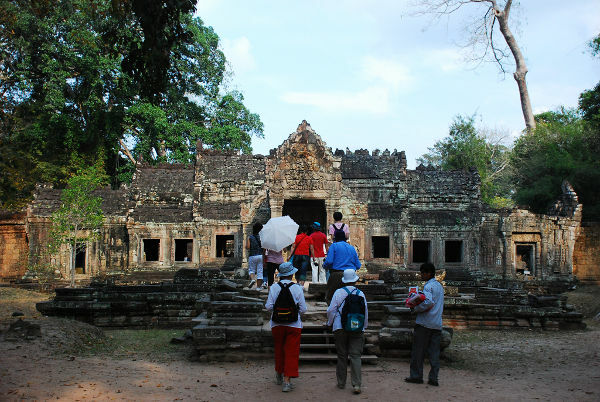 So here’s Preah Khan… the main facade. If look through the middle of the photo above, you can see that there’s quite a bit of walking to do still. Thank God for the crowds. The road is very dusty. I wore my Crocs throughout this trip. And this is the dustiest I’ve ever got. 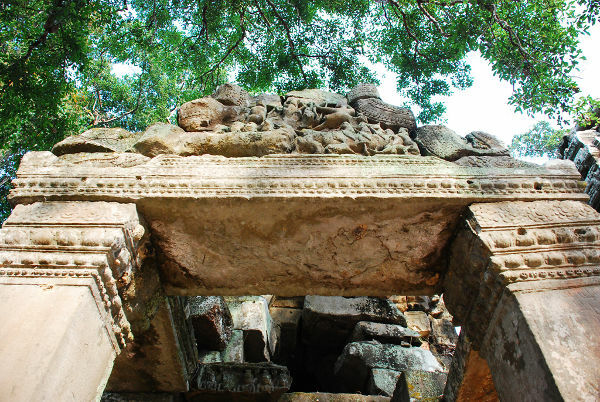 One of the archway at the main facade of Preah Khan. Ahead of us are a group of Japanese tourists. Yeah for the crowds. Imagine it’s just me and the temple. I’m not that brave. I know the adventurous lot would wish for no tourist. It’s just them and the temples. But not me. I’m a scary-cat. Okay? Look at the carving especially the wheels. Simply A.M.A.Z.I.N.G yeah? 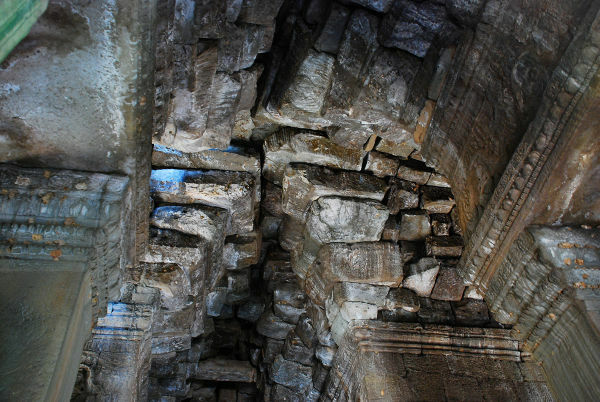 Preah Khan was constructed in the late 12th century C.E. That was like 800 years ago. And for the carvings to stand the testament of time, weather & human greed is simply WOW. 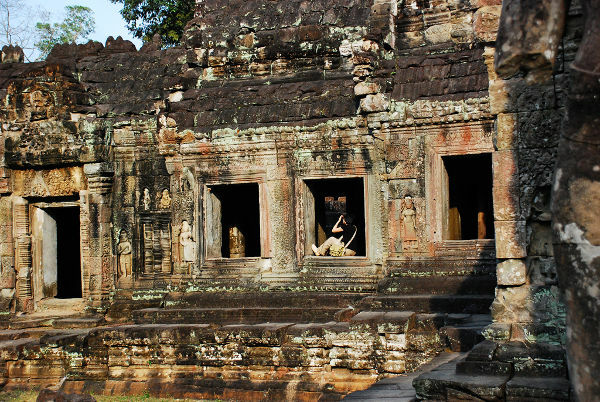 That is why the whole of Angkor Archaeological Park is a UNESCO World Heritage Site. Look at the ceiling of the temple. That’s how they stack ’em. You will see the same thing in Angkor Wat. How on earth did they do that? I HAVE NOT IDEA. SUPER Genius!!! Notice the purple fruit? 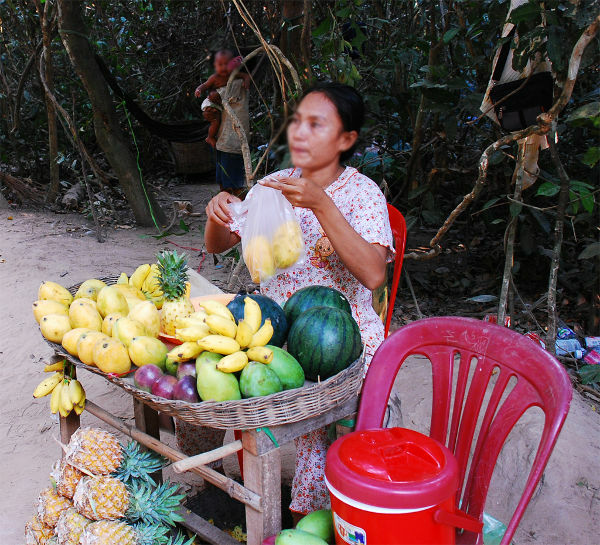 That’s Khmer fruit as the lady told us. Also known as milk fruit (source from internet). Since we have some time left, we stop at the North Gate for some photos. 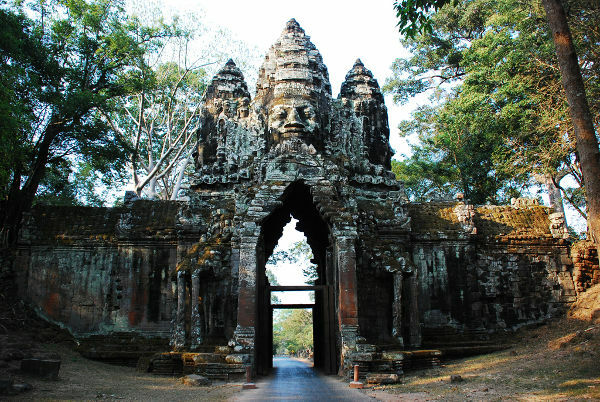 This is the North Gate of Angkor Thom. Only 1 vehicle can fit through the gate. While passing by, trying look up. You will wonder whether this gate will fall on you! Because the ceiling is being supported by wood beams. This is the other side of North Gate. This view is more stunning. The trees and dusk lights gave the gate an aura of yesteryear. If you view the above picture on larger scale, you will notice 2 long thingy jutting out on both side of the gate. They are the elephant trunks. I guess the gate is shaped this way for the elephants to pass through during the Khmer Empire. 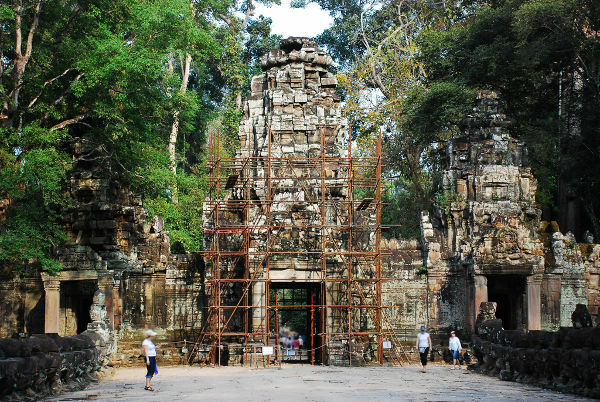 The South Gate of Angkor Thom is the busiest entrance/exit point. In short, the whole of Angkor Archaeological Park is like a big kampung (village). There’s the monuments and then there’s also Khmers settlements located randomly in the park. The Khmers still live in the park as were their ancestor who built Angkor Wat more than a thousand years ago. Angkor Wat after all means City Temple. After exiting South Gate we passed by Phnom Bakheng (Bakheng Hill), the no. 1 sunset spot. Saw a very large crowds and the climb up Phnom Bakheng is damn scary. It was very steep. 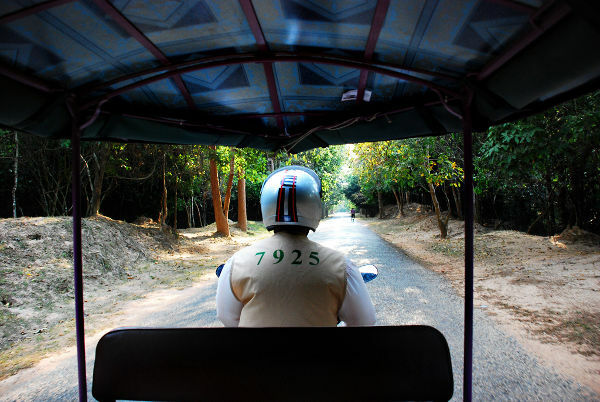 Like 89 degree vertical from my point of view from the tuk-tuk… hahaha No plans to go up there. With still a little time left, we decided to have a sneak peak of Angkor Wat. 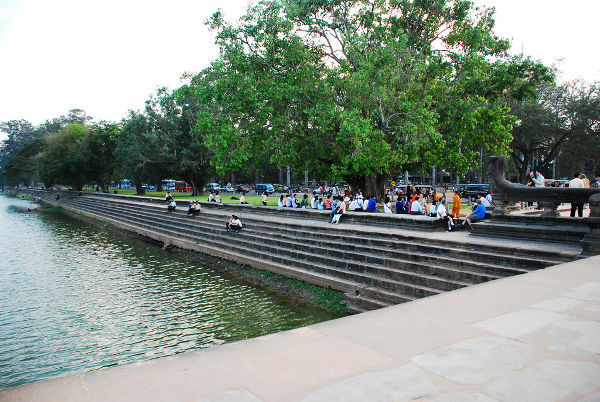 Along the moat banks… a place to relax and chill on the sight of Angkor Wat. The long walk up the sandstone causeway. Moat on both side of causeway. It was 5pm. The sun is setting. Perfect time for long walks. Very crowded… a far cry from Preah Khan. The west gate of Angkor Wat. 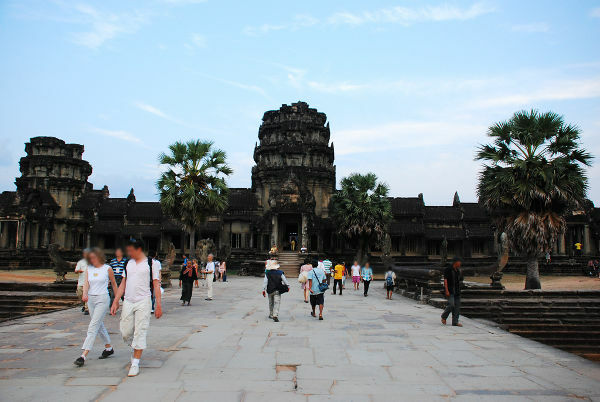 This is the main entrance (the most famous gate) of Angkor Wat. Our sneak peak ended at the other side of west gate. No more walking for us today as our stomach is growling for food. 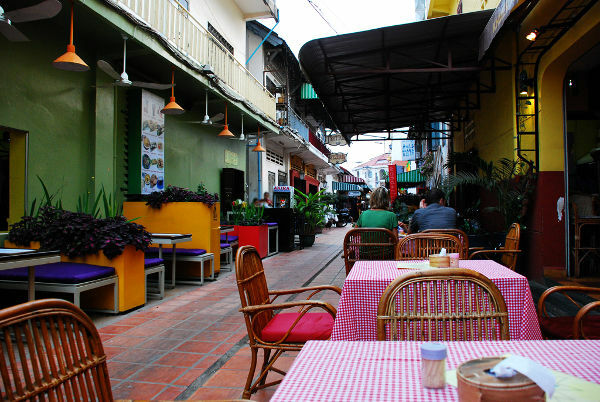 This time we sat outside the restaurant which is along Pub Street Alley. We had French omelette @ US$2.50 and sweet sour chicken (I think) @ US$3.00. No drinks. Didn’t take the food picture as I wasn’t feeling alright. If you remembered, I wasn’t feeling well prior to my Siem Reap trip. Well the bug is coming back again. Thankfully I had my medicine with me. That’s all for my Siem Reap day 1 travelogue. Day 2 coming soon. 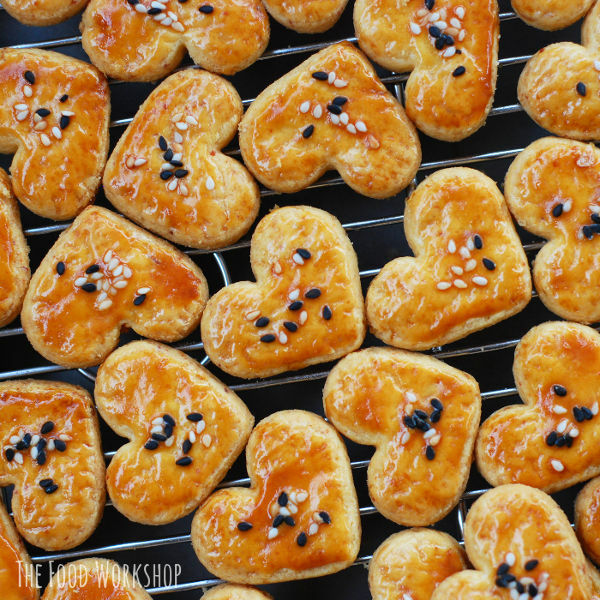 The milk fruits look interesting. Hahaha, sick of temples…that’s how I felt when I went to China – this temple is don’t know how many thousands years old, that temple too..but I love the stone carvings in Angkor. STunning photos and a great trip there! Must be enjoying your life! London Caller, nope we didn’t try them because we have no idea how to eat the fruit. Alexallied, sikit-sikit enjoy aje because the HOT weather kinda spoil it. I would choose after raining season if/when I’m going there again. Cecil Lee, I took some pictures of Pub Street Alley at night but they came out blur because I was on the go. Didn’t have time to really stop and took it. Haha The night life is interesting there. Many ang mohs coming out drinking. i didn’t get a chance to stop at preah khan. the carvings remind me banteay srei. 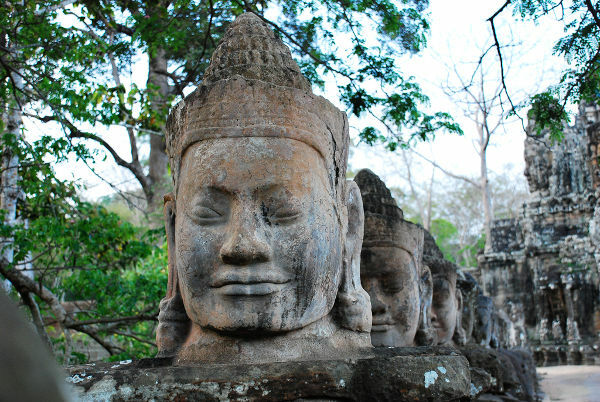 and the gates of angkor thom are great.. the wall of statues! ur time of visit must have been even hotter than when i went in december. Lechua, Oh I thought you visited Preah Khan. 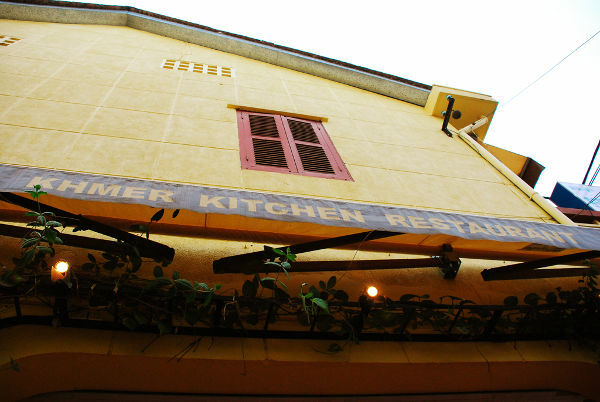 How many days did you spent at Angkor park? Yes Jan-May are the hottest months. Wow! Very intrestinglah! I can’t wait to go there! I wonder Angkor Wat is haunted or not? If I am alone there with no tourists around, wonder how it feels like! Oh, you gave me a very useful tip – bring along plastic card to keep the temple pass! Why they make it so easy to tear? So they can charge you for a new one? Clever also! haha! What time is the place closed to visitors? At 6pm? Since you said you only have 1 hour after 5pm? The deserted road looks quite scary! That’s why better to have a guide with you! Haha! Luckily there are crowds! Since it’s such a huge place, will you get lost in there? You didn’t go further into the temple? But you flew all the way there – surely it would be a waste not to visit every corner? Climbing up the Phnom Bakheng is scary? What happens if someone climbs and falls to his death? Too bad? Hey, you didn’t mention why you got stomach ache in the previous post. What happened after that? Was it the carrot drink? 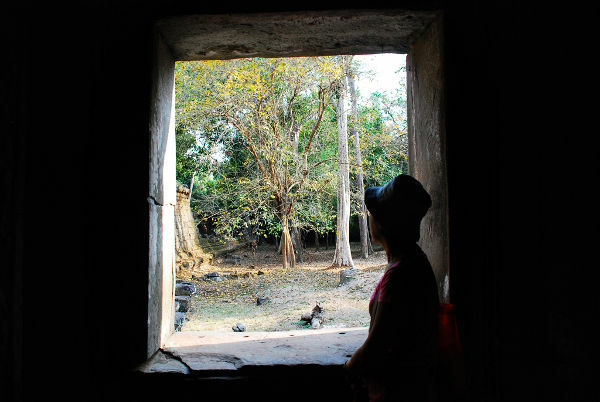 Foongpc, In certain parts of Angkor Wat we were alone… the feeling? Kinda spooky. Keep positive and everything will be fine. 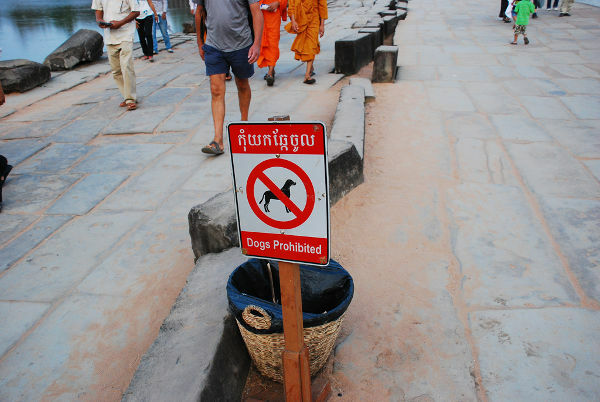 If I go to Angkor again, I might hire a guide for the sake of my travel partner who is a ‘information buff’. Me? I don’t think I need one. I can read everything in the web. Haha Of course there are certain infos that you can’t find in www but I think all you gotta do is mingle with the locals and you got yourself more information than you need. Plus I don’t think I will remember all the information the guide provide as there are so many temples in Angkor. Visiting hour for the temples: 5.30am to 5.30pm (printed in the ticket pass). I asked the local and they say they usually allow visitors up to 6pm. I didn’t climb Phnom Bakheng but from my view in the tuk-tuk, it looks scary. There were a couple of fatal accidents over the years at the temples (especially Angkor Wat and another one I’ve forgotten)… due to the steep steps. So be careful. Yeah the stomach ache is due to the carrot drinks. When buying mineral water, we have to be careful too. This is one very big temple complex. I will need more days to explore the place. Now I am confused. 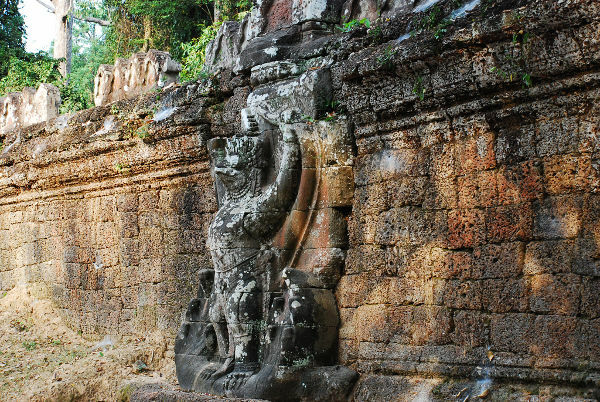 Is Preah Khan within Angkor Thom? 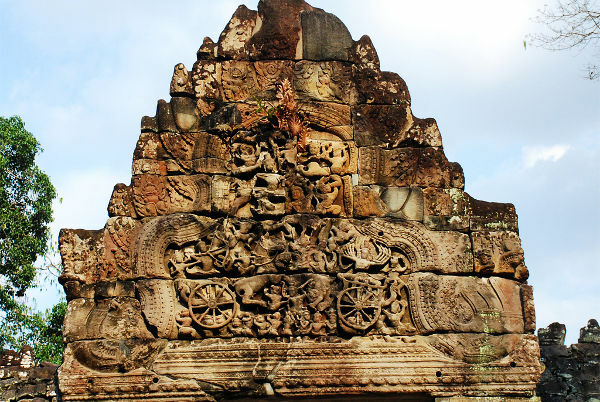 Preah Khan is not within Angkor Thom. It’s outside of Angkor Thom but to go there we must pass Angkor Thom. 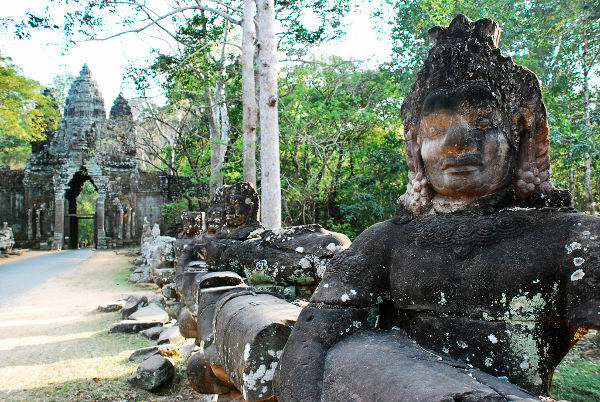 Angkor Thom is like a small city with north, south, east and west gate.